Research center expansion at the University of Kentucky strengthens campus through creation of a new, modern quadrangle tactically formed by building program. 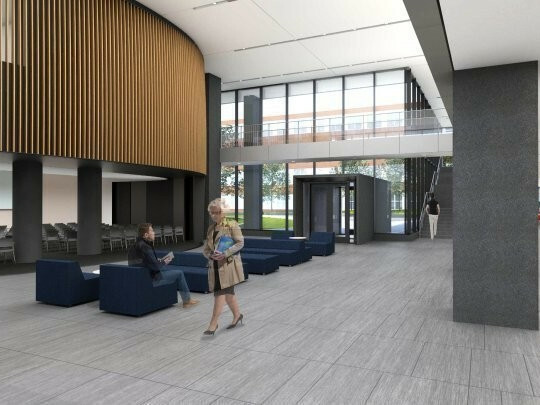 The University of Kentucky endeavors to build a Research Building (RB2) that provides the flexibility to handle the current and future needs of world-class researchers, supporting grant-funded exploration, and analysis while attracting and retaining talented scientists. 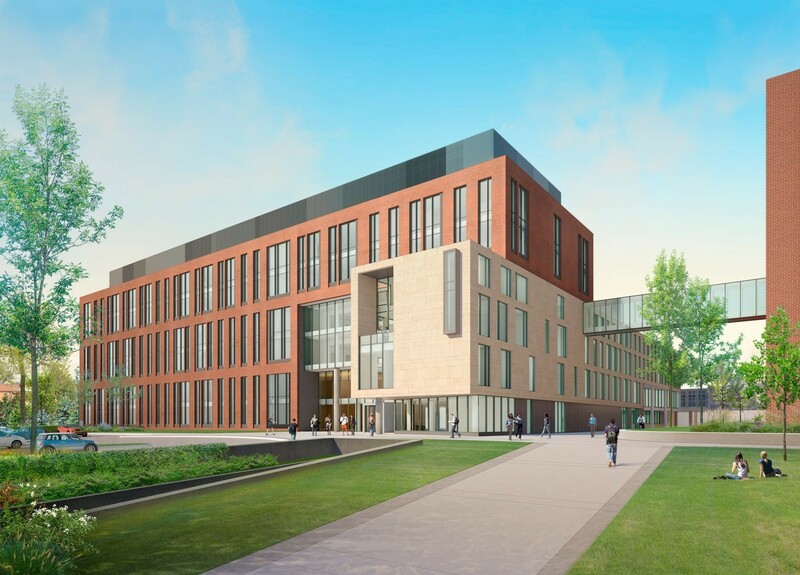 Laboratories are to be open and adaptable, accommodating diverse Biomedical (medicine, pharmacy, nursing, health sciences), Psychology (neuroscience), Agriculture (animal research), Arts and Sciences (biology, chemistry), and Engineering (imaging, computational) research programs. 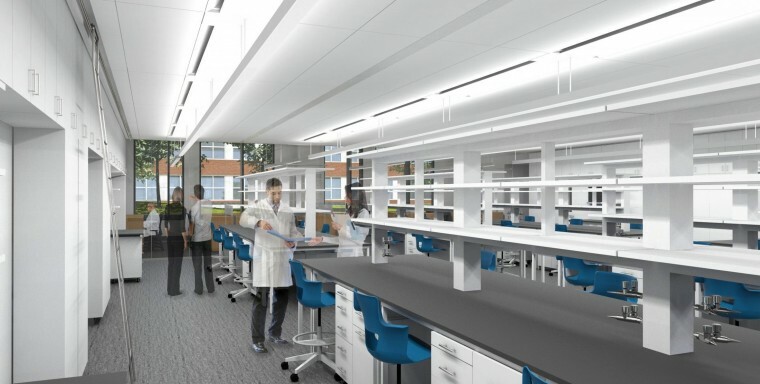 Atop a vast basement level plinth housing support services and large vivarium, six levels of new wet experimental labs parallel the existing Biomedical Biological Sciences Research Building (BBSRB), with three levels of new dry computational labs occupying a intersecting bar that connects to the BBSRB (parallel to the existing adjacent College of Pharmacy) — forming a new landscaped research quadrangle. 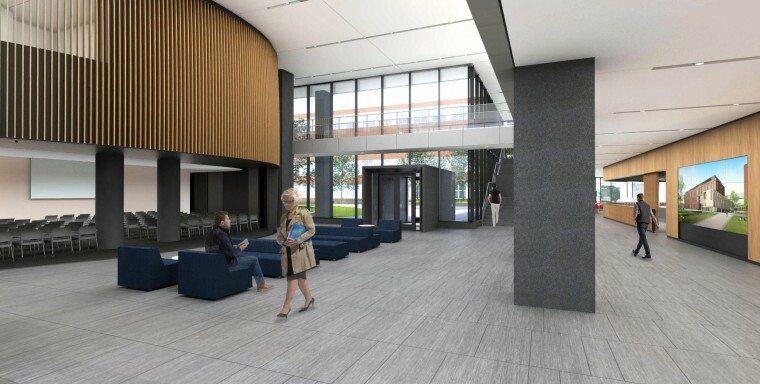 Project scope involves a phased build-out, with an ultimate construction cost of $214M. 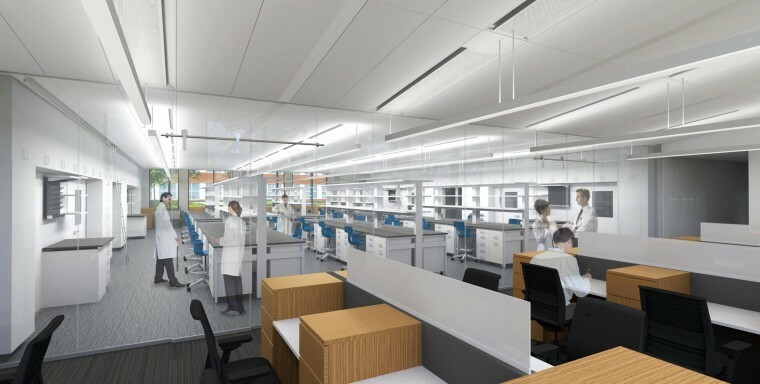 Each floor contains two to three neighborhood lab modules, with support, equipment, and procedure rooms opening directly off. 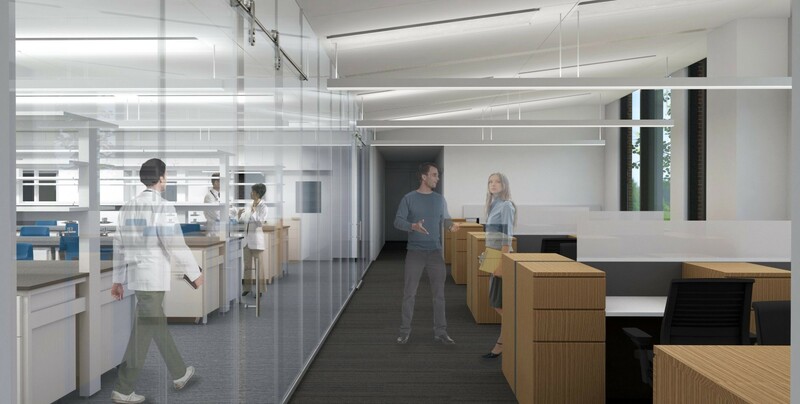 Experimental lab modules are glazed on opposite sides, offering views through and borrowing daylight from adjacent open-office write-up workstations (for student technicians); research faculty and flex offices further line exterior walls along circulation corridors. 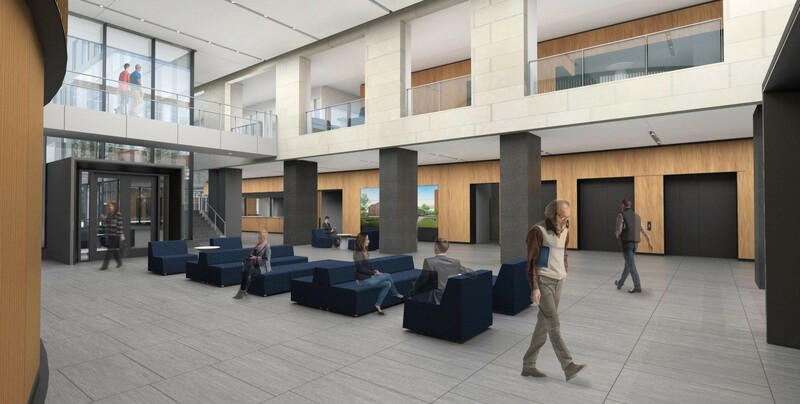 Open workstations fill computational lab zones, glazed to the public corridor with views into the courtyard quadrangle — with research faculty and investigator offices lining the opposite perimeter wall. Flexible lab and office furniture allow users to adjust and modify to fit changing needs. Informal collaborative spaces occupy corner zones. 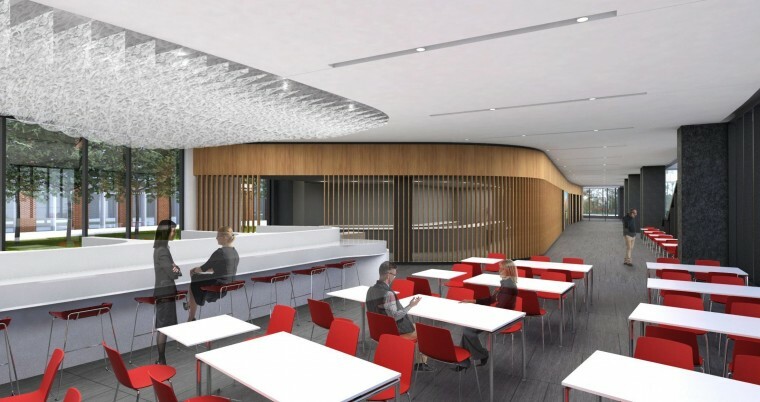 The double-height main floor entry lobby becomes a forum-like space, featuring a unique seminar and conference room “pod” revealed via an oak-paneled sliding wall system. A large café is just beyond, with a slatted oak screen defining the servery. Generous glazing offers building occupants needed respite from the intense research atmosphere. Exterior facades utilize campus’ prevailing red brick and limestone aesthetic; fenestration patterning is a modern, computational riff of that utilized on adjacent buildings. Champlin Architecture is the Architect of Record, with HGA as Design Architect. RB2 is currently under construction, with an anticipated completion in 2018.